In this tutorial, we will set up a small project with automated visual tests using Puppeteer, Jest and VisWiz.io. Puppeteer is a Node.js library which provides a high-level API to control headless Chrome. It is a great tool to perform browser automation tasks. Jest is a Node.js testing framework which is fast, easy to setup and very flexible. To complete this tutorial, you will need an environment with Node.js >= 8 available. We'll use the global setup and teardown scripts to start Puppeteer and our web app server in the next steps. For now, we just create those two files and have them export an empty async function. Let's also add a test script in package.json for convenience. We want to start our app's server before the tests start (in the global setup script) and stop it when they end (in the global teardown script). For this tutorial, we're going to use a static HTML page with a few static assets, which will all be served by a minimal express app. Depending on how your app is structured, you might have a different method of accessing it, so replace this section with your custom logic for starting and stopping your app. Running our tests now will start our express server, and the test will be able to make an HTTP request. We made good progress so far. It's time to throw Puppeteer into the mix. We're going to follow the official documentation on how to use Jest with Puppeteer. Afterwards, we create a custom test environment for running tests in Jest in tests/test-environment.js. This allows us to create a new Puppeteer instance and connect it to the headless Chrome started in our global setup function. Now it's finally time to write our first test which will load our app in Puppeteer and give us access to all of its APIs. You can do a lot with the Puppeteer API, so feel free to implement as many functional assertions as your app functionality requires for each page. To add visual regression testing with VisWiz.io into our tests, we're going to capture screenshots of our app during our tests. These screenshots should be taken at different points during the testing phase, depending on your app's requirements and business logic. You could make this code more DRY by creating a helper method to take these screenshots. Note that the example above is using environment variables available in Travis CI. Replace those with the corresponding environment variables from your CI system. For the final integration of VisWiz.io in our tests, we need to have the following environment variables available: VISWIZ_API_KEY and VISWIZ_PROJECT_ID. You can export these in your terminal shell while developing, but you will need to define these in your CI system (please refer to your CI documentation on how to define environment variables). To get your API key and project ID, follow our Getting Started guide. 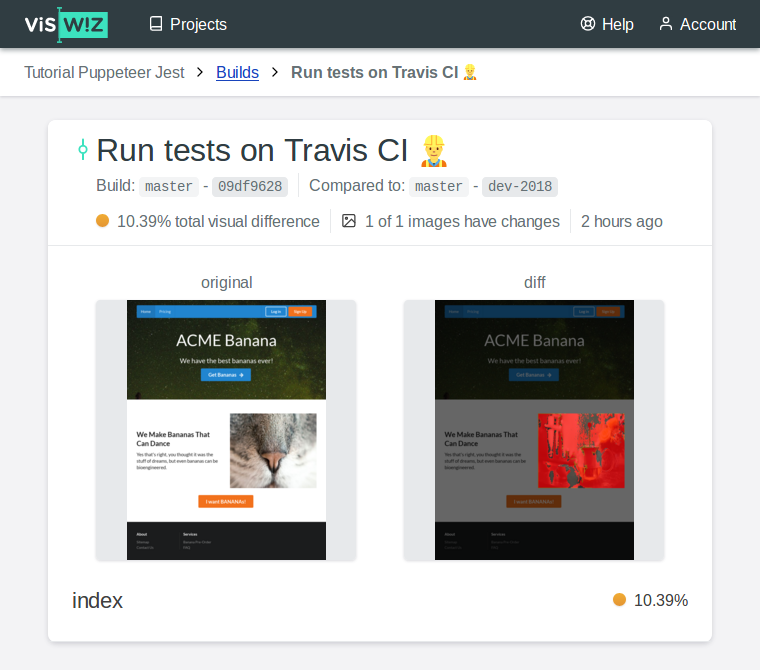 When you run the tests now, you will send the images results from your tests to our VisWiz.io service for regression testing. After running the tests, open your Projects page, choose your project and open your last build to see the report for it. You may notice that by default Puppeteer open the pages in an 800x600 viewport. You can customize the size of the viewport using its setViewport API method. This enables you to test your application in a variety of viewports to validate your app's responsiveness. You can also follow this tutorial with the actual code, commit by commit, on our tutorial repository: github.com/viswiz-io/viswiz-tutorial-puppeteer-jest. Congratulations! You are now ready to start visually testing your projects with VisWiz.io!